Flowing red and yellow ribbons create an impression of celebration and constant movement as they weave through intertwining forms on white enamel. 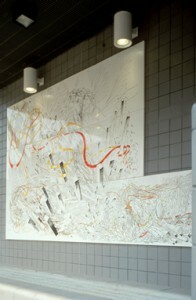 Mr. Michaels transferred his famous bas-relief images onto fired porcelain panels, enlarging them photographically to create a 90-foot long work, which can be viewed as a whole or as two individual compositions. This artist normally creates 3-D artwork out of pieces of stones, steel, metals. For this piece, he spent months drawing very tiny fine line drawings. He then photographed the drawings and blew them up to the size of the panels. Silk-screened the drawings onto the panels and fired them at a very high heat. Also handpainted the yellow and red ribbons.